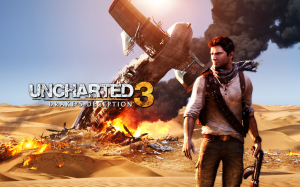 “Uncharted 3: Drake’s Deception” released on Nov. 1 and is the third installment in the “Uncharted” series developed by Naughty Dog and published by Sony, exclusively for the PlayStation 3 and this entry proves that the series is still going strong. This trilogy is very impressive. “Drake’s Deception” takes place approximately four years after the events of the first game. Nathan Drake and his friend Victor Sullivan, or “Sully” for short, once again set out on an adventure to find the riches left behind by ancient explorers. Their journey is fueled by the fire that burns inside of Drake to find the true path of Sir Francis Drake’s quest for a lost city known as the Pillars of Iram. “Drake’s Deception” explores the origins and importance of the ring that Drake has worn on a necklace since the first game and its connection to the lost city of Iram. Along the way, some old friends join the quest, and portions of Drake’s past are revealed as the history behind Drake and Sully’s friendship becomes more apparent. With their sights fully set on an unbelievable fortune, Drake and his friends head to the Rub’ Al Khali desert to find the treasures that Sir Francis Drake seemingly failed to find. That is, if they can make it to the lost city before a foe from the past, Katherine Marlowe and her right hand man, Talbot stop them from attaining their goal. The gun play in “Drake’s Deception” is for the most part, the same as in previous games with a few minor tweaks to the aiming. The hand-to-hand combat has been fleshed out with many new moves and enemy take-downs, as well as some new one-hit kills. The game focuses on hand-to-hand combat and the use of stealth a lot more than the previous games, which is a nice addition to the exploration, puzzles and gun play. “Uncharted 3” is a far more diverse game play experience that the first two games in the series. The interactive movie feel is back and better than ever. Naughty Dog truly stepped up their game in this respect. The graphics take the stunning beauty of “Uncharted 2” quite a few notches higher and there will once again be times you’ll want to just stop and admire the settings that surround the characters. “Drake’s Deception” does still feature a lot of the game-play hiccups that made that immersion lose some of its effect in the previous games. Issues like stumbling over and bumping into the environment, randomly jumping to your doom, and poor balance of the artificial intelligence still make the experience frustrating at times. “Uncharted 3” also feels much less polished than its predecessors as graphical stutters and bugs are a bit more noticeable. There are even times when an AI character will just randomly run around until you blast him in the head and end his misery. But despite its minor technical issues, “Drake’s Deception” is ripe with amazing sequences and super fun game play. While it starts out slow, the story and game play have moments that really draw players right back into the action. Similar to the train ride scene in “Uncharted 2” which was a fan-favorite. There are some great moments in “Drake’s Deception” that have the player jumping from moving object to moving object while fending off enemies and trying not to go tumbling toward a quick death. The pirate ships, the horseback ride and the rooftop chase scenes are some of the most awesome moments in the entire series. “Uncharted 3’s” online component is very similar to “Uncharted 2” but disappointingly, the rewards menu, which featured skins and unlockable cheats in the previous games, is gone from the single player and is now a part of the online experience. Players earn money for killing enemies and completing multiplayer objectives to buy new skins, weapons and unlockables for the online modes in the game. A split-screen co-op feature as well as many new maps and modes bring the online playability full circle. Overall, the eight-to-nine hour single player adventure in “Uncharted 3: Drake’s Deception” is what makes this title a must-have and a definite game of the year candidate. The third installment in the “Uncharted” series brings the trilogy to an epic end, but also leaves it wide open for future incarnations. Naughty Dog has outdone itself for the second time with this series and delivered an experience that goes above and beyond its previous title. “Uncharted 3’s” simply amazing gameplay and story make its missteps forgivable. The “Uncharted” series is definitely a trilogy that should be experienced by everyone. This entry was posted in Arts & Entertainment, Game Reviews, Sac City Express (SCC) and tagged among thieves, chloe, deception, drake, elena, exclusive, fortune, nathan, naughty dog, pirate, platform, playstation, ps3, sully, uncharted. Bookmark the permalink.